I would like to say thankyou to Leslie @LaMamaNaturale of Recycle Your Day for hosting a great giveaway recently (which I was so blessed to win!)? Be sure to check her site out when you get a chance! The giveaway rules asked for us to go to the sponsor’s website and pick out our favorite item.? The site had some really great stuff, but my absolute favorite thing was the Baby Blessed Bracelet. And guess what!? I got it!!! The artist is a doula and a mother of three.? She has a special understanding and love for pregnancy, birth, and babies.? Her ETSY store Bellyblessings Designs is the result of over 10 years of passion for pregnancy combined with a love of making jewelry. 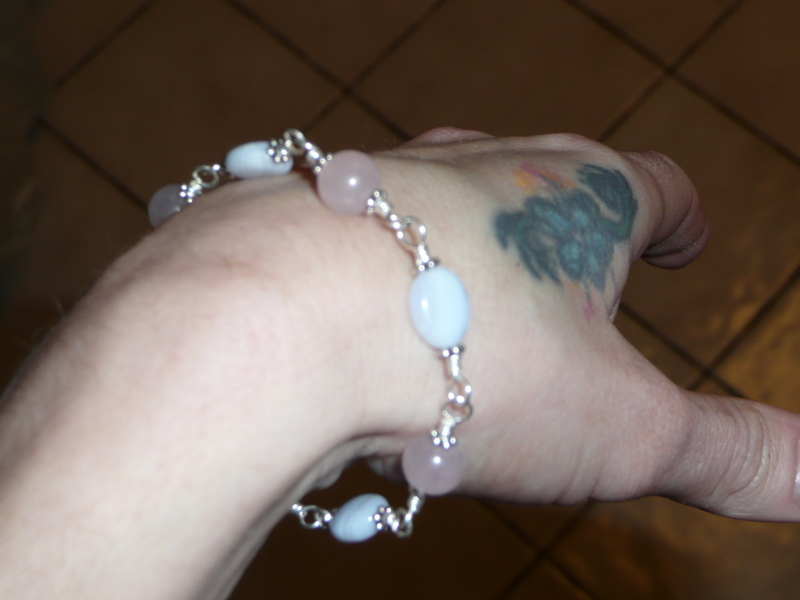 Here is the awesome bracelet I won! This picture definitely doesn’t do it justice.? I just wanted you to see me actually wearing the bracelet.? Here is what it REALLY looks like. According to the artist, this bracelet was designed for the expectant mother.? 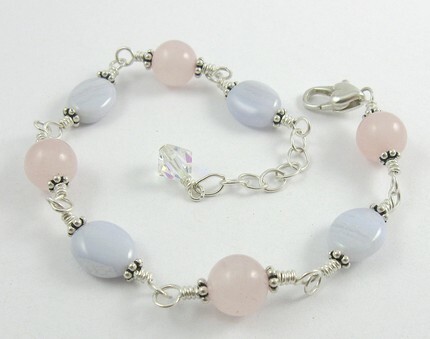 It is made with light rose quartz rounds for girls, and blue lace agate ovals for boys.? It represents your unborn baby and all of their potential.? I love that!? The heart-shaped clasp, spacer beads and findings are all sterling silver.?? Those details are what got me, especially the tiny heart clasp – perfect! I just had a baby, so it is a blessing to have and to wear.? I will cherish it for many years to come.?? By the way, the artist was so kind to throw in a matching pair of earings as well – wasn’t that nice? So you guys just HAVE to check out her store!? She has lots of great stuff and the prices are very reasonable. Thanks for sharing this post. The bracelet is stunning. You lucky gal. How sweet that you received a pair of matching earrings…that rocks! 🙂 Great site- BTW. I love that bracelet. It is really pretty. I want, want, want one of these braclettes! They are SO cute! My sister and cousin (that’s like a sister) are both preggers and these would be perfect! i would love to have a bracelet like that! i will check out her store now! congrats to you!